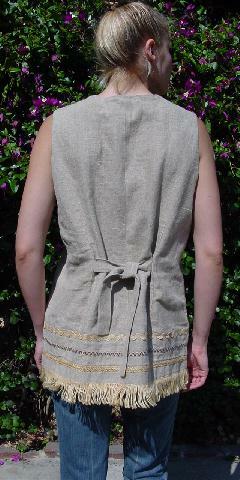 This A Pea in the Pod blouse is 100% linen and is in a wheat color. 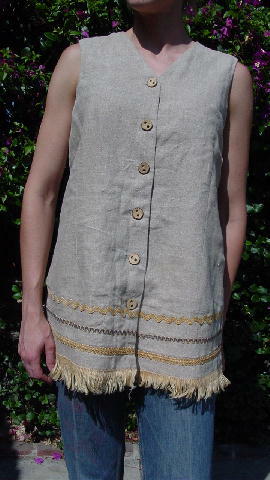 It has 6 buttons that look like wood chips, a V neckline, and is sleeveless. There are three horizontal rows of different ornamental cording in golden-maize and blue. The bottom has 1 1/2" long golden maize fringe. The back has two 14 1/2" by 1 1/8" ties. It's from a French model who wore it with expandable pants when she was pregnant. shoulder to end of fringe 29"